There’s no dispute in most cases that dental implants are superior to removable dentures as a restoration for missing teeth. One area in particular is the effect a removable denture can have on remaining bone and other structures of the mouth, especially if their fit becomes loose. If you’re a denture wearer, you probably know that loose dentures are a major problem, one that can worsen the longer you wear them. The denture compresses the gum tissue it rests upon to produce forces that are more detrimental than what the jaw normally receives from natural teeth. The underlying bone will begin to dissolve (resorb) under these compressive forces. This in turn changes the dynamic of the denture’s fit in the mouth, and you’ll begin to notice the fit becoming looser over time. The loose fit can be remedied with either the production of a new denture that updates the fit to the current structure of your jawbone or by relining the existing denture with new material. 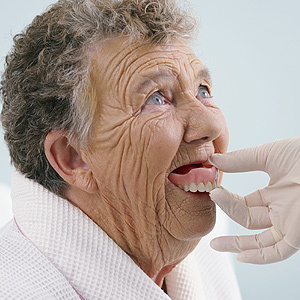 Relining can be done as a temporary measure with material added to the denture during your visit to the office, or as a more permanent solution in which the material is added at a dental laboratory. With the latter option, you would be without your dentures for at least a day or more. Even if dental implants for multiple teeth aren’t feasible for you financially, you do have other options. With one particular option, the removable lower denture can be held in place and supported by two strategically placed implants. Not only can this lessen the risk of developing a loose fitting denture, it may also alleviate most of the compression on the gum tissue and reduce the rate of bone resorption. The result is better function for eating and speaking and often a boost in self-confidence, as well as many more years of effective wear from your dentures by limiting bone loss.